Furikake (ふ り か け?) Is a Japanese food spice in the form of granules, flour, or fibrous as abon. This spice is sprinkled over rice and eaten as a side dish. Furikake is not made when it wants to be eaten, but it is made at the same time in large quantities and eaten a little later on. Today's food manufacturers make furikake in a variety of flavors and attractive packaging. 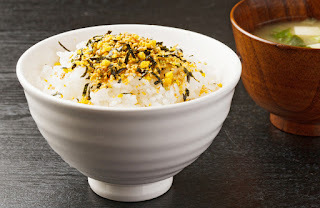 A kind of furikake called ochazuke spice (ochazuke no moto) is sprinkled over rice and doused with hot water or hot green tea to make ochazuke. When making onigiri, the rice that has been sprinkled furikake stirred first before formed as big as the fist. All the ingredients to make furikake are crushed until smooth and seasoned. After drying, other contents (such as nori, sesame seeds, or dried vegetables) are added to the furikake as flavoring. Fresh Furikake (furikake name) is a variation of furikake that is not dried. All ingredients are simply mixed and stirred into one. The ingredients for fresh furikake are anchovies, katsuobushi shavings, small pieces of seaweed, kombu, abon fish or other seafood.